Basel, 28.6.2018. 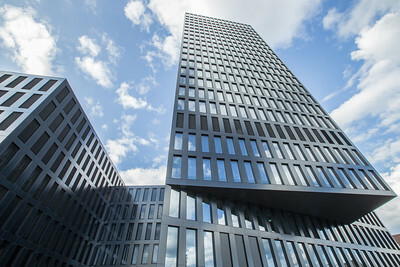 As of today construction on the Grosspeter Tower in Basel is completed. 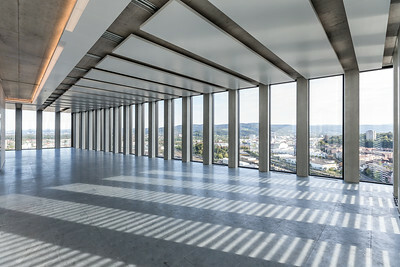 The Zurich-based client PSP Swiss Property took the occasion to officially inaugurate this energetically exemplary building. What is not immediately apparent is that the façade generates electricity. The prerequisite of the client was that an in all respects sustainable building should be designed. These aspirations are particularly expressed in the façade, as the integrated photovoltaic elements generate enough electricity to cover a large part of the energy requirements. As the solar cells are almost unrecognisable the Swiss architects Burckhardt+Partner AG could reinterpret the otherwise seen as technoid expression of these elements into an item of design and architecture. The rigorous design of the façade of the two interlocking structures impresses already from afar. The Grosspeter Tower expands the skyline of the city at a prominent location along the railroad tracks leading to the SBB train station. Within the six-storey base are a hotel, conference rooms and office spaces; the almost square tower offers additional office spaces. The design of the façade concept is the result of the condition by the client that only half of the façade itself should be transparent. The smaller the area of glass the lesser the heat loss and input, which at the same time creates a good balance between utilisable daylight and agreeable indoor climate. During the realisation of this extraordinary building the architects benefitted from a technical innovation. "Just as we started the design of the façade a significant development within the solar power market was made" says Andreas Kaufmann, project architect with Burckhardt+Partner AG. The solar elements, which up to 2014 were only available in standardised dimensions could now be manufactured according to client and project specifications. In order to keep the floor plans of the office units flexible and to allow them to be joined over several floors all tenant offices are provided in a basic fit-out. According to the client PSP Swiss Propertymore than 80% of the available spaces are already let or reserved. 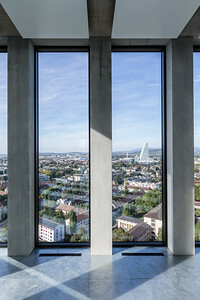 The Grosspeter Tower, whose façade is basically a power plant, does not only set a statement in technical, energetic and aesthetic aspects, but is in addition also an expression of the necessary urban densification and efficient use of the limited availability of land in the canton Basel-Stadt. Several awards have already been bestowed upon the Grosspeter Tower for its energetically exemplary measures combined with the classic, timeless architectural language. It received a prize for the Best Swiss solar architecture 2017 in the category new builds. Besides winning the third prize in the Prixforix 2018 it also won the jury prize of the sun21 Faktor-5 award 2018. Burckhardt + Partner AG is an internationally significant and technologically leading architecture firm for award-winning solutions. The firm was founded in Basel in 1951 and has since then continuously grown. Over the last 65 years it has not only contributed to significantly shaping the architecture of Switzerland, but has also asserted itself on the international scene. Currently Burckhardt+Partner AG have five offices in Switzerland and three in Germany.